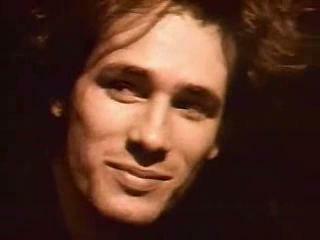 I’ve been so lucky to have been able to play the cello with some of the most amazing musicians, but by far the greatest was Jeff Buckley. Of course he’s shot up the charts recently through his beautiful cover of Leonard Cohen’s Hallelujah – surely the antithesis of X-Factor..? I mean, no-one can sing like that. No-one should be physically able to sing like that. Jeff Buckley singing, withpianist Catherine Edwards, violinist Ian Belton and me on cello, in Elvis Costello’s Meltdown Festival, July 1st 1995. I remember, this singer arrived really late, just before the show, dishevelled, all cheekbones, cool hair, black jeans and the biggest boots you’ve ever seen supporting a rake thin body. He apologised – got out his music – a kid’s exercise book with the lyrics of the songs written out in a crazy biro scrawl. – If a word was written high up the page, well then it meant it was a high note. At one point he asked me what country he was in… he was confused between Germany and the UK that day as I think he’d flown in with little sleep. When he started singing Dido’s Lament at the rehearsal, there were all these classical musicians who could not believe it. Here’s a guy shuffling up on-stage and singing a piece of music normally thought to be the property of certain types of specifically developed voice, and he’s just singing, not doing it like a party piece, but doing something with it. That’s an understatement… I remember the lights being pretty bright and the silhouette of his frame as he bent almost double to wrench every ounce of meaning from a song written 300 hundred years ago. Better than any classical musician I’ve ever heard. As he was singing, a photographer shuffled along past the feet of the audience in the front row at the Queen Elizabeth Hall to get a shot, unaware that they were for that second the most hated person in London, and got a good clout round the head for their troubles from someone who should remain nameless. My last memory of him was at the little party in the green room afterwards. There were all these people sitting round Jeff who’d never met before – Fretwork, the viol group, a classical pianist and some jazz player – all talking and laughing about music. He’d charmed everybody. I’d much rather remember that than anything. [youtube=http://youtu.be/z7SCIsSF-8I]This was it without my commentary… but the record company removed it…! What a pure talent and thanks for sharing the story / video… swimming in it’s tones as I type!